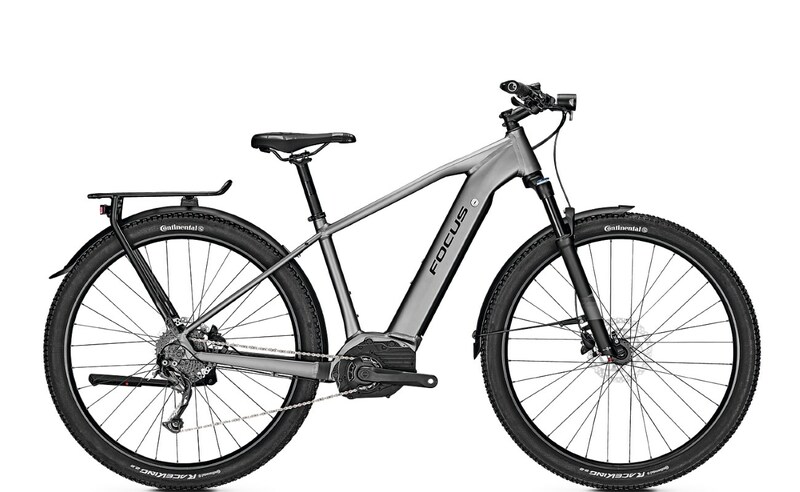 The Aventura2 6.7 is a high quality trekking ebike from German giant Focus. It boasts a plethora of features and performance. Multipurpose in nature, the Aventura2 is an ideal solution not just for daily commutes in the urban jungle, but also for railway cuttings, canal towpaths, and the like. It’s hard to beat on value for money. Bosch’s 60Nm Performance motor powers the Aventura2, and couples with a huge integrated 500Wh battery. The result is an ebike with stunning good looks with equally enviable performance! SR Suntour Raidon suspension forks provide 100mm of travel and a smooth ride on all terrain. The 15 x 110 mm thru axle with quick release makes for easy access wheels. A super light alloy 6061 frame ensure reliable and resilient handling together with a high degree of maneuverability. The Shimano Alivio 9-speed derailleur provides ultra smooth gear shifting on an 11-36T cassette. This in turn provides more than ample hill climbing ability. Shimano hydraulic brakes offer powerful and controlled braking actions when needed. Equally, a soft touch will gently calm the Aventura2 when called upon. The PURION display from Bosch features on the Aventura2 6.7, and sits unobtrusively on the left-hand side of the handlebar, totally out of harms way. Its large, no fuss crystal clear display is easy to read and provides all necessary information for the rider. A handy walk-assist feature is also available. Fully kitted with mudguards, rear carrier, and lighting, the Aventura2 is a workhorse with huge potential. Focus certainly have a real winner in their great spec, ultra-competitively priced trekking ebike. Bosch’s powerful motor is at the heart of the Aventura2 6.7 complemented perfectly with 500Wh of battery integration to produce sleek and sporty lines. The Aventura2 6.7 is a truly versatile ebike with huge appeal to those wanting a classy look and high end performance.